The subtitle of this non-fiction book is The Untold Story of Luigi Del Bianco. 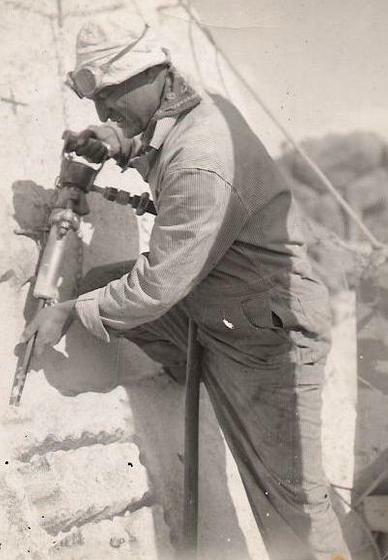 The journalist-author sets out to "correct an egregious injustice" and to get for the Italian-American stonemason/sculptor, who was the Chief Carver on the Mt. Rushmore project from 1933-40, the "kudos" which he "rightfully and richly" deserves. It is a commendable goal, and the story of that struggle by the author and the man's family continues beyond this book, with progress being made each day. The author presents his case well, with help from the Del Bianco family's research among the papers of Gutzon Borglum, the Master Sculptor of the Mr. Rushmore project, in the Library of Congress, where Borglum praises his Chief Carver above all the other people on the project, stressing Luigi Del Bianco's importance to the project's artistic success. 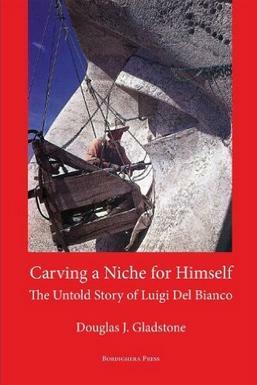 Many fascinating interviews, correspondence, facts and varied background information collected by the author provide a broad picture for the reader of who Luigi Del Bianco was, what he did, and why he and other Chief Carvers have not been included in the story of Mr. Rushmore written by other authors and the park service, which manages the site. Like many Italian immigrants who contributed significantly to their new countries, Luigi Del Bianco is recognized in his hometown in Italy. 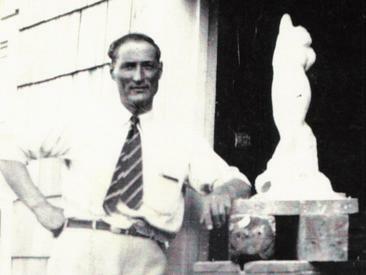 The story of Italian stonemasons and sculptors who emigrated to America could fill a whole book by itself. The author does a good job telling the reader about where those men came from in Italy, where they often went to in America, and what they accomplished in their new country. An immigrant journey to a new life is, as always, a fascinating one. "History has not treated Luigi Del Bianco very kindly." So, why have the Chief Carvers of Mt. Rushmore been put in the back seat very far behind the Master Carver Gutzon Borglum? There are many reasons, mainly valid ones, for that, since the Master (Maestro) Artisan always takes full credit for art created with the help of apprentices. Why has Luigi Del Bianco been written out of the history of Mt. Rushmore, even in books purporting to be about the team behind the Master Carver? There are more complex reasons for that, into which the author bravely delves. Real history is usually ugly, and for that reason people tend to clean it up for modern consumption, through the romanticization of it, the editing of it, and even the obliteration of it. There is much ugliness in the real history of the Mt. Rushmore project. The romanticization, editing and erasure of history has happened there by the wagon-load. 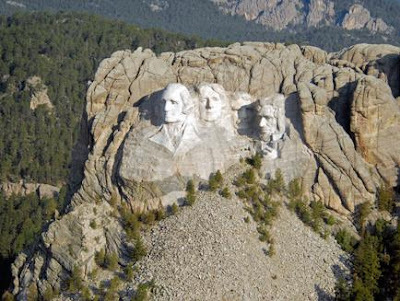 The carved mountain face was conceived by the Ku Klux Klan leader Borglum to be a piece of monumental art dedicated to the Manifest Destiny nonsense U.S. politicians and businessmen invented to validate their greedy push to take all the territory between the Atlantic and Pacific Oceans. 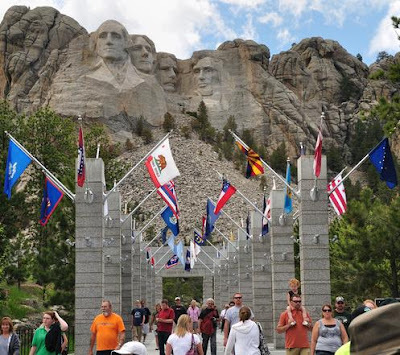 Borglum fought to have Teddy Roosevelt included on the rock face, because Roosevelt was a hero for many greedy businessmen, who saw President Roosevelt as a man who would extend U.S. Manifest Destiny to lands beyond the North American continent, to create a U.S. Empire. The Mt. Rushmore project began in South Dakota just when the Klan, which had been revived to fight immigration, especially of Catholics, and even more specifically of Italian Catholics, had been elected to offices throughout the western states. Luigi Del Bianco, a U.S. citizen since 1928, and his family, moved there at precisely that time, and they suffered bigotry and ostracism from the white local residents and many of the local workmen on the Mt. Rushmore project. As you can imagine, many locals wouldn't want to wash their dirty linen in public, especially when that linen contained a pointed hood. If they were to give Luigi Del Bianco his due in the project, the evil, bullying treatment he and his family received would have to be recognized as well, along with the Klan's history in South Dakota. The Del Biancos found friends in the local Native Americans, who welcomed the family who was ostracized just as they were. That too would have to be recognized if Luigi Del Bianco were written back into the history of Mt. Rushmore. Of course, that would bring up the upsetting history of Mt. Rushmore being a holy site for the Natives, that was cruelly defaced with the representations of four people who symbolically represented the centuries long massacre of Native Americans. From the late 1400s to the late 1800s, 20 million Native Americans died from disease, war and starvation. If that were put in modern terms, in relation to the population at the time of the massacre, it would be as if 92 million people were killed today to free up land. As a side note, the trans-Atlantic slave trade, which occurred over the same period, took 18 million lives, which in today's terms would be 83 million lives. That is an awful lot of death for one nation to have on its conscience, so it is no wonder that the ugly truths of that history have so often been romanticized, edited, and obliterated. Some strides have been taken very recently to put the real history back into the flag-waving, rah-rah monument, the so-called Shrine to Democracy, that Mt. Rushmore was made into for the modern car-tourism era, obliterating some ugly history so the locals and the Federal Government could earn some money. That is commendable. The author of this book aims to have more strides made, more quickly, and that is commendable too. With the family's help, and the help of many Italian-American organizations, and with some politicians, and some park service employees, it may come to happen. This book is part of that effort. dogged obstructionism involving passive ostracism and active hostility. Here are the descriptions and Amazon links for three books that together present an intelligent image of Mt. Rushmore and Luigi Del Bianco, with as little historical romanticization, editing and obliteration as possible. Luigi Del Bianco may not be a household name to many historians, but he should be. 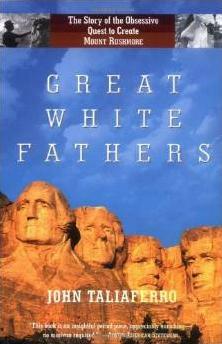 He played an integral role in the creation of Mount Rushmore, specifically, that of chief carver. Was Del Bianco slighted due to his Italian heritage? Gladstone more than suggests he was. This book will be an inspiration to Italian Americans everywhere, and sheds new light on the role of Italians in America's history. The year is 1935. Italian immigrant Luigi Del Bianco, a classically trained artist, is the chief carver on Mount Rushmore. Luigi brings his wife Nicoletta and his three small sons out to South Dakota to live with him while he assists sculptor Gutzon Borglum do what has never been done before: carve a mountain. As “Bianco” climbs 500 feet in the air to bring “refinement of expression” to the faces, he is met with nothing but resistance and resentment from the powers that be on the project. His pay is withheld for weeks and in the words of Borglum, Luigi has had “chronic sabotage” directed against him by the office staff in Rapid City. When Luigi quits the work, all carving on the faces comes to a halt. Borglum persuades Luigi to stay because “he is worth more than any 3 men in America for this kind of work”. Luigi’s family fares no better. His sons are ridiculed for being “greaseballs” by the local bullies and Nicoletta finds herself a stranger in the far reaches of her own country. 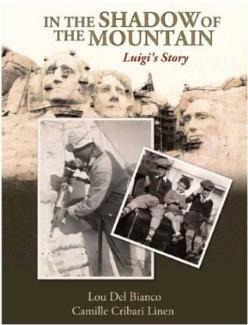 “In the Shadow of the Mountain” gives Luigi Del Bianco long overdue recognition for his invaluable contribution to our nation’s most iconic memorial. Co- authors Lou Del Bianco (Luigi's grandson) and Camille Cribari-Linen tell a story about fulfilling a dream; dealing with intolerance; forming unlikely friendships and family connections. It’s a story emerging from of the shadow of the mountain …Luigi’s story. Gutzon Borglum, the sculptor of Mount Rushmore National Memorial, hoped that ten thousand years from now, when archaeologists came upon the four sixty-foot presidential heads carved in the Black Hills of South Dakota, they would have a clear and graphic understanding of American civilization. Borglum, the child of Mormon polygamists, had an almost Ahab-like obsession with Colossalism--a scale that matched his ego and the era. He learned how to be a celebrity from Auguste Rodin; how to be a political bully from Teddy Roosevelt. He ran with the Ku Klux Klan and mingled with the rich and famous from Wall Street to Washington. Mount Rushmore was to be his crowning achievement, the newest wonder of the world, the greatest piece of public art since Phidias carved the Parthenon. But like so many episodes in the saga of the American West, what began as a personal dream had to be bailed out by the federal government, a compromise that nearly drove Borglum mad. Nor in the end could he control how his masterpiece would be received. Nor its devastating impact on the Lakota Sioux and the remote Black Hills of South Dakota. Great White Fathers is at once the biography of a man and the biography of a place, told through travelogue, interviews, and investigation of the unusual records that one odd American visionary left behind. It proves that the best American stories are not simple; they are complex and contradictory, at times humorous, at other times tragic. Luigi Del Bianco's family has a wonderful website dedicated to their relative. The author Douglas J. Gladstone is on Facebook. A man in South Dakota did find a pointed hood in the family linen, literally, and that led to his digging up some of the buried ugly history in his state about the Klan and his family and his neighbors' families involvement with it. Here is an article about that man. 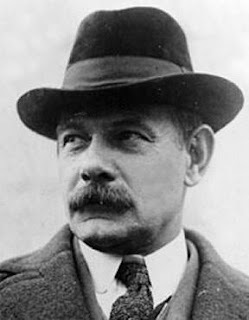 Gutzon Borglum was a brown-nosing, fame-seeking, ego-driven man, who associated with some very nasty types to get his name in the history books. His other attempt at a monumental piece of art carved into the side of a mountain, was in Atlanta, Georgia, to commemorate the Confederate leaders who fought to keep slavery, and to commemorate the Klan who succeeded in keeping the freed slaves subservient during Reconstruction. The Klan was resurrected again during the Civil Rights Era when their Reconstruction Era efforts were overturned. Here is an article of interest about the Klan's involvement in the Stone Mountain Monument. Stephen Pinker, of Harvard University, is the author of the study comparing deathly events from history in terms of the population at the time of the deaths. Here is an interesting article. Mt. Rushmore is the subject of quite a few documentaries and books. Here is a link to the PBS documentary that you can view on-line.